· This is James Hinchcliffe’s second win of 2013 and the second win of his Indy car career. He won at St. Petersburg in March. · Andretti Autosport has won three of the four races in the 2013 IZOD IndyCar Series season. In addition to Hinchcliffe’s wins at St. Peterburg and Sao Paulo, Ryan Hunter-Reay won at Barber. · Hinchcliffe led only the final lap of today’s race. The last driver to win leading only the final lap of the race was Dan Wheldon, who won the 100thAnniversary Indianapolis 500 in May 2011. Hinchcliffe is the 13th driver to accomplish the feat since 1946. · The margin of victory of today’s race was .3463 of a second. It’s the closest finish in four races in Sao Paulo and the 13th closest road/street course finish in Indy car history. · Takuma Sato finished second, his second consecutive podium finish in Brazil. He finished third last season. · Marco Andretti finished third, matching his season-best third-place finish at St. Petersburg. Andretti is the only IZOD IndyCar Series driver to finish in the top 10 at every race this season. · Josef Newgarden finished fifth, his first top-five finish in the IZOD IndyCar Series. 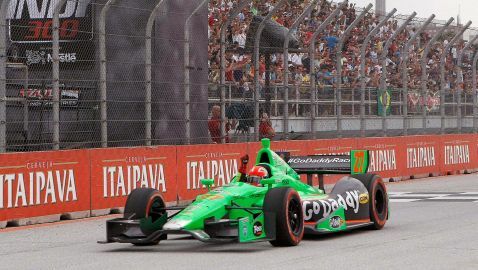 · James Hinchcliffe is the first Canadian to win an Indy car race in Brazil since Greg Moore won at Rio on May 10,1998. LARRY FOYT (Team Director, A.J. Foyt Racing): “It’s been a great turnaround for our team for sure. We struggled for speed actually this weekend in Brazil, we struggled to find a set up. Takuma just drove another good race and the guys had a good pit stops. It was funny the way the yellows were falling. It was kind of a gamble on what we did and we got lucky it worked out. We had a chance to win it and Takuma had a chance to win it, we just ran out of tires at the end. The guys, our engineers and Takuma just never gave up. (On momentum going into Indy): I don’t think I’ve ever come down Gasoline Alley and had to take a left to our pit box. This team is really doing a fantastic job. Takuma is driving just amazingly. It’s been good so going into the month of May, obviously this is a long month and anything can happen, but always a positive to have good momentum going into Indy.